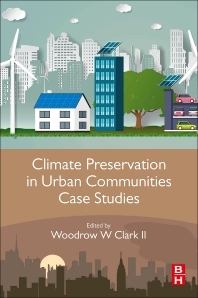 Climate Preservation in Urban Communities Case Studies delivers a firsthand, applied perspective on the challenges and solutions of creating urban communities that are adaptable and resilient to climate change. The book presents valuable insights into the real-life challenges and solutions of designing, planning and constructing urban sustainable communities, providing real world examples of innovative technologies that contribute to the creation of sustainable, healthy and livable cities. Examples of successes, failures and solutions are presented based on a cross disciplinary approach for infrastructural systems, including discussions of drinking water, wastewater, power systems, broadband, Wi-Fi, transportation and green buildings technologies. Dr. Clark has leveraged decades of international research to bring an essential focus on climate preservation. This book is an up-to-date and relevant compilation of thought leadership and cases drawn from technology, science, and economics. Policy makers in California would take heed to read this book as the need to foster green, smart and healthy communities is greater than ever. A must read book for anyone interested in understanding the issues that climate change poses for urban communities. The range of topics covered is excellent and the associated content provides valuable insights into the challenges and solutions for creating urban sustainable communities.